Tangled and True: so good. These are seriously so good. Everyone that has tried them has loved them. Stir coconut over medium heat until golden and crisp. Remove and set aside. Add oil to pan and place over medium heat. Add shallots, ginger, garlic and meat. Stir until no longer pink. Add lime juice, peanuts, coconut, chiles and soy sauce to taste. Can also add fresh mint. I think you're missing a step in the directions saying to add the pork? 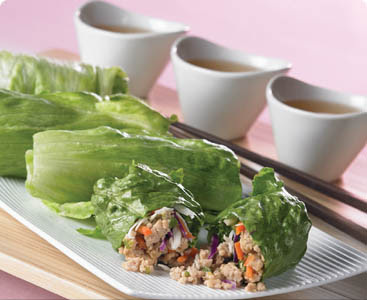 mmm...Im a huge fan of lettuce wraps - it looks fab! umm...love lettuce wraps, we will have to try these for sure!